Highland’s Andrew Wheeler looks to connect from long range in his team’s Friday win over visiting Mount Gilead. Mason Mollohan tallied a team-high 12 points for Mount Gilead Friday. Highland’s Mack Anglin points to the crowd after being recognized for reaching the 1000-point mark. Everything came together for the Highland boys’ basketball team on Friday night when they hosted Mount Gilead in a KMAC game. The team played stifling defense in a 76-38 win on the school’s Winter Homecoming night and senior Mack Anglin was able to reach the 1000-point mark early in the fourth quarter. Highland’s defense allowed them to go on multiple runs that allowed them to extend their lead consistently throughout the game. With the score tied at two just over a minute into the action, Highland got a bucket from Andrew Wheeler followed by seven straight Anglin points to turn a tie game into a nine-point Scot lead over a span of 66 seconds. 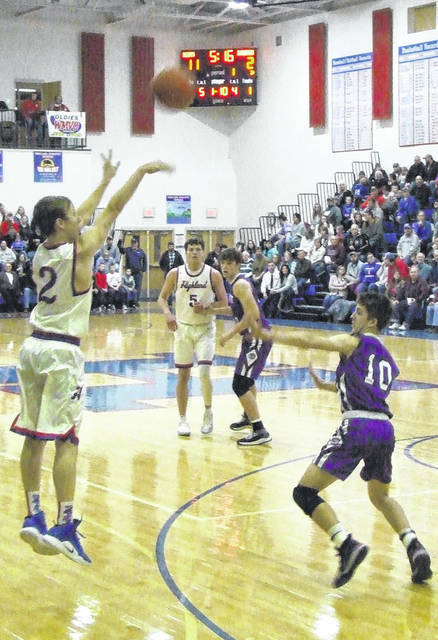 After MG’s Mason Mollohan, who also hit the 1000-point mark earlier this month, tallied a three-pointer and a pair of free throws for the Indians, the Scots finished the quarter strongly. Ian Taylor scored three points and both Wheeler and Noah Dado had two apiece as Highland held an 18-7 edge after eight minutes. A three-pointer by Mollohan followed by a basket from Jackson Huffer brought MG back within six early in the second period. However, with the score 24-16 in favor of Highland at the 4:03 mark of the period, the Indians found themselves outscored 12-3 over those final minutes of the half. Anglin tallied six of Highland’s points during their run, while MG could only muster a Huffer three as they fell behind by a 36-19 margin. Indian coach Dan Strasser noted that his team’s issues with wasted possessions was on full display during the game. Highland effectively put the game away with a dominant third-quarter performance, opening the period with an 18-2 run sparked by eight Taylor points to lead 54-21. Strasser stated that his team simply needs more help from the team’s supporting cast, as Mollohan had 12 points at this time, while the rest of the team had combined for nine. 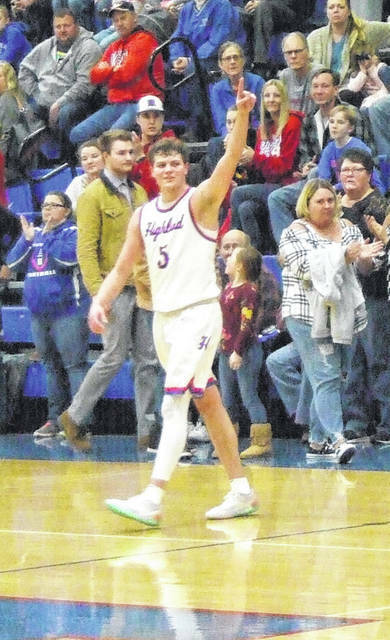 After Micah Tuggle hit a basket and free throw and Huffer added a basket for the Indians, Anglin scored five straight points to end the third quarter with Highland up 59-26. He would add a pair of free throws to open the fourth quarter and reach the 1000-point mark. From there, both teams gradually emptied their benches, as the Scots went on to win and come closer to claiming the KMAC title. Currently, they’re 9-1 in league play — two games ahead of Centerburg and Fredericktown with four league games left. One thing that gives the coach optimism is the way they are playing on offense now. Anglin led Highland with 25 points, while Taylor scored 12, Wheeler finished with 10 and Dado added eight. 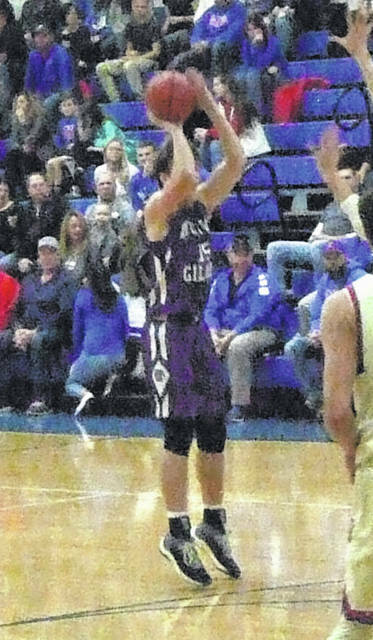 For Mount Gilead, Mollohan had 12 and Colton High came off the bench to finish with eight.